There is an immediacy to this story, an urgency to tell it. In light of the current immigration situation there is a need to provide an historical context to the evolution of our country’s methods for handling the thousands of people seeking out a new life within our borders. And Gittel’s Journey is an excellent opportunity to increase understanding and empathy in a beautiful and touching way. 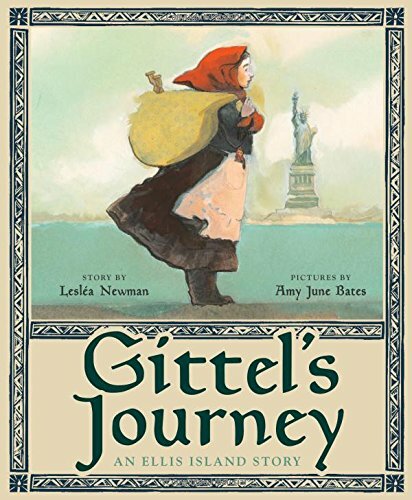 Gittel is a nine-year-old Jewish girl from an undesignated place somewhere in what the author’s notes indicate as the “Old Country.” Bidding a tearful farewell to her friends, Gittel and her mother make the journey to the port, hoping to travel to America for a better, safer life. Gittel’s mother is turned away by an official for having an eye infection. Gittel, terrified, is sent off on the boat all by herself with few possessions and a note with an address written on it clutched in her hand. Stunning and powerful watercolor illustrations point out the serious, even ferocious look on the border guard’s face; the sinking dread of the choice the mother must make is clear even in her profile; and Gittel’s innocence is wrapped in a protective red head-scarf as she tries to comprehend what is about to happen to her. Strong compositions derived from gestures and glances are vitally important and hauntingly captivating, the perfect match to the atmosphere of the narrative. So compelling that they could capture and propel the plot all on their own. Making the two-week journey alone, we watch Gittel make some friends, ache for her home, try to comfort herself, and endure this harsh reality as best as her young nine year old’s emotions can muster. There is no doubt she is sad, and this is a trying and formative time for her. Seeing the Statue of Liberty was “the most astonishing thing that Gittel had ever seen . . .” But the longing for her mother dampens the adventure considerably, and Gittel’s story is far from over. All the senses come alive in the description of the disembarkation mayhem. Boots and shoes clatter in her ears, cold ocean spray smacks her face, the taste of salt water dapples on her lips, the loud boisterous gibberish of so many incomprehensible languages clang around in her head. Doesn’t anyone here speak Yiddish? It just so happens, yes. And in a kind old-fashioned scene we witness a tender connection that would be highly improbable in the stress of today’s immigration picture: compassion. A clever and unexpected reunion occurs and a happy ending is a relief because in the real world our news indicates that happy immigration endings are an endangered species. Not to diminish the impact of the overall story, but there is missing a real compelling explanation of why Gittel and her mother must leave their home. We are told only that it is not safe and must take mother’s word for it. Was there really no way for them to wait a few weeks for mother’s eye to heal and they make the trip together? Pushing past these minor holes leaves a solid read-a-loud experience of one family’s immigration experience. Gittel's Journey: An Ellis Island Story is historical fiction at its picture book finest.